Goodbye, high-rise oddity, hello lower, wider and more conventional five-door hatch alternative to Audi A3 and BMW 1-Series rivals. Mercedes has at last turned the A-Class into a real contender. Third time lucky, you could say. It’s a good looking design, with a lot going on: rising swage lines, bonnet creases, LED clusters… you certainly couldn’t call it anonymous. It’s especially head-turning with optional big wheels, black glossy bits, pointy ‘Sport’ grille and huge sunroof. It’s just been facelifted, note, but it’s all pretty subtle stuff. Beneath it is a fresh front-drive chassis, a broad engine line-up and, says Mercedes, availability of extras you normally only find on a C-Class and E-Class. You can turn your A-Class into a futuristic high-tech utopia, if you have the cash. Mercedes-Benz A-class cars are known for offering sophisticated interiors and dynamic styling, and the A-Class is not an exception. The vehicle gets a diamond grille with shiny metallic pieces, sharp headlamps with Bi-Xenon projectors, which are covered by a bold metallic rim on one side and LEDs on other side. The long bonnet with aggressive flowing lines adds to its sporty look. On sides, the aggressive character lines and strong belt line that starts from headlamps and ends just above the rear wheels further enhances the overall appeal. The flared wheel arches have been fitted to large and light-weight, multi-spoke 17-inch alloy wheels, while the wing mirrors get integrated blinkers. At the rear, the hatchback has spoiler with an in-built FM antenna and LED tail lamps. The premium hatchback is available in 10 exterior shades including Cosmos Black, Polar Silver, Canyon Beige Metallic, South Seas Blue, Monolith Grey, Cirrus White, Jupiter Red, Mountain Grey, Night Black and Universe Blue. On the inside, there’s decent space in the rear by hatchback standards, although the sloping roof means the headroom is tight, and the small windows and black insides give it a cooped-up feeling. This back seat certainly won’t offer the comfort you associate with a luxury car, but then this car is meant to pander more to the driver. The rest of the cabin is just as plush as an E-class, but feels far more modern. The SLS AMG-style triple air-con vents, the free-standing screen for the COMAND interface, the sculpted steering wheel and the chequered-design dials add to the youthful flair. The single-piece front seats are superbly snug, and the knobs, switches and stalks work precisely. The pedals are slightly offset, but this is made up for by the fantastic driving position. However, the steeply-raked windscreen and the small rear window compromise visibility, which is bothersome in traffic and when parking. Although Mercedes has skipped on electric steering adjustment and even a powered front passenger seat, there’s still plenty of kit; our test car had Bluetooth connectivity, seven airbags, ESP, Bi-Xenon headlamps and USB connectivity. Even the massive panoramic sunroof comes as standard. Like mentioned above, the automaker has retained both the engines from the outgoing version. Its diesel versions have been fitted with a 2.2-litre power plant that has a displacement capacity of 2143cc. It is incorporated with a fourth generation common rail based direct fuel injection supply system for optimum fuel efficiency. It comprises of four cylinders and sixteen valves based on double overhead camshaft valve configuration. This motor also has a turbocharger with variable nozzle turbine that enables the motor to pump out a maximum power of 136bhp in the range of 3600 to 4400rpm and generates a commanding torque output of 300Nm between 1600 to 3000rpm. On the other hand, its petrol variant is fitted with the same 1.6-litre in-line motor that has high pressure direct fuel injection system featuring piezo injectors. This 1595cc mill can belt out a commanding power of 120.7bhp at 5000rpm that yields in a hammering torque output of 200Nm between just 1250 to 4000rpm. The transmission duties of both these power plants are handled by a 7-speed dual clutch automatic transmission gearbox that releases the torque output to its front wheels. The new Mercedes A-Class comes with the same engine options like its outgoing model. The A 180 Sport is housed with a 1.6-litre petrol mill that is incorporated with a high pressure direct injection system featuring piezo injectors. It offers a mileage in the range of 12 to 15.5 Kmpl, which is rather good. The diesel version gets a new nomenclature with ‘A 200 d”. This version houses a 2.2-litre mill under the hood with CRDI fuel injection technology. It is capable of producing a peak mileage of 20.06 Kmpl. Its oil-burner comprises of 4-cylinders, 16-valves and is further equipped with a turbocharger. This 2143cc mill can belt out a maximum power of 136bhp that yields a hammering torque output of 300Nm. On the other hand, its petrol mill is also based on 4-cylinder configuration. This turbocharged motor has the ability to produce a peak power of 122bhp along with a mammoth torque of 200Nm. The Mercedes A-Class has been a very good handler always and this quality remains consistent in the 2016 model too. The steering is very direct and weighs up nicely as the speed progresses. Ride quality is a bit stiff but the 16-inch wheels really help matters. The high profile rubber tackles uneven and broken tarmac without breaking a sweat and the A-Class feels easy to drive on what we call roads. Dealers do offer bigger wheels as options but that comes at the cost of ride quality. On the braking front, the hatchback performs nicely as expected and it sheds speeds without any sort of unnecessary drama. A number of safety features are available in this model, which ensures high level of protection. It has Attention Assist function that is useful to detect the drowsiness of driver especially, when it is speeding in the 80 kmph to 180 Kmph range. It comes with sensors that analyze the driving behavior and warns the driver. The active restraint system is another device that has rear doors and windows with child locking system, manually adjustable rear head restraints, seat occupancy sensor and so on. There are multiple airbags available to safeguard the occupants during critical driving conditions. Meanwhile, the tyre pressure loss warning system keeps the driver alert if, there is a loss in tyre pressure. Not only it monitors the rotational speed of individual wheels but also identifies the tyre pressure loss. The hill hold assist function helps it to move off on inclines easily. The electronic stability program keeps the vehicle stable by applying brake force to individual wheels. There are hazard warning lights that gets activated automatically when it slows down from a speed of 70 kmph to a standstill and this works in conjunction with brake assist system. The anti lock braking system on the other hand, prevents it from skidding even when sudden brakes are applied. The adaptive brake lights are activated during sharp braking particularly, when the speed is over 50 kmph. Aside from all these, the list includes audible warning signals for front seat belts, crash responsive emergency lighting, ISOFIX child seat anchorage with fastening points, brake pad wear indicator and many others. In the end, the A-class comes across a compact, premium and properly impressive runabout. It’s got almost everything we like about big Mercs — a solid build, high-quality interiors and a decent ride, all with a huge dose of youthfulness. The engine in the A 180 could’ve done with a little bit more grunt, but apart from that, there’s little to fault. The bigger concern is whether or not Indian buyers will accept a hatchback as a genuine luxury car. But there’s a good chance the A-class, with its stunning looks and sheer desirability, could trigger India’s first compact luxury car revolution. 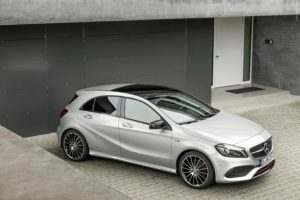 Mercedes Benz A Class Ex Showroom Price in New Delhi ranges from 28,88,601/- (A Class A180 Sport) to 29,89,614/- (A Class A 200 CDI) .Mercedes Benz A Class has 2 Variants of Petrol are available in India. Mercedes Benz A Class comes in 5 colours, namely Elbait Green,Cirrus White,Cosmos Black,Jupiter Red,Polar Silver.